Tropical Storm Ampil has battered Shanghai with damaging gusts of winds and torrential rain. The storm first made landfall in the Japanese Ryukyu Islands, before heading towards the Chinese mainland. More than 190,000 people were evacuated from their homes as the storm bore down on the financial hub. Numerous flights from Shanghai's two international airports, Pudong and Hongqiao, were cancelled or delayed and some of the city's metro lines were suspended. As Ampil tracked across the East China Sea, the warm water and weak winds in the upper atmosphere would normally encourage a storm to strengthen, but dry air drawn in from the south prevented the storm from intensifying. The dry air also ensured that the more ferocious rains were to the north of the storm's centre. The eye of Ampil slammed into the tiny islands just 80km east of Shanghai, at which point the storm took a sudden and unexpected turn to the north. Although torrential rain and strong winds slammed Shanghai, the centre of Ampil didn't hit the city. Instead, it is now skirting along the east coast of the Jiangsu province and the latest forecast brings it very close to the city of Yancheng at approximately 18:00 GMT on Sunday. The eight million people who live in Yancheng could see as much as 300mm of rain from the system, bringing widespread flooding. The storm is then expected to move inland and disintegrate over the Shandong province, bringing further flooding across a wide area. 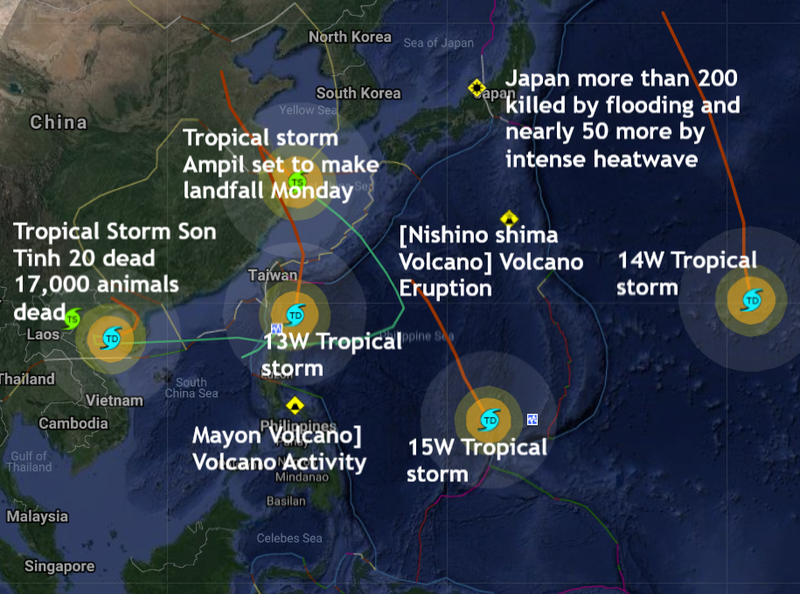 Six tropical storms are lined up along the East-Asian coastline in a group of weather patterns which resemble something from the film "The Day After Tomorrow"
It started in Japan a few weeks ago when torrential rain killed more than 200, more than 8 million people were advised or urged to evacuate across 23 prefectures, caused by Typhoon Prapiroon. The floods were followed by a deadly heatwave killing a further 50. More than 8 million people were advised or urged to evacuate across 23 prefectures. Yesterday Vietnam news declared tropical storm Son Tinh has killed 20 people, left 16 missing and injured 14 in Vietnam. Floods triggered by heavy rains hit northern Vietnam after Son Tinh made landfall in northern coastal areas on Thursday, while the capital Hanoi was flooded and lashed by torrential rains. More than 5000 houses were damaged, swept away, submerged or collapsed, around 82,000 hectares of crops were damaged and nearly 17,000 animals were killed nationwide, the Vietnam National Committee for Search and Rescue said in a report on Saturday.